Meet Rocky. I spent the afternoon at the Nolan home with him and his sister, Ginger. These little dogs were so cute, I couldn’t resist making one of the pictures from today’s photo shoot my picture of the day. This was my first real photo shoot with animals, and it was both an adventure and learning experience. First of all, Rocky and Ginger were very well-behaved. However, it was a challenge getting both of them to look the same direction at the same time. Also, using a flash made their eyes green. Photoshop does wonders, of course, but I’m wondering if anyone out there has experience photographing animals and if they have any advice for further projects? Diffuser to use? Compact portable lighting? Very nice blog. And a very sweet dog. Ah, what an adorable shot. I love the inquisitive look in his eyes, and the tilt of his head. Your photos are so crisp and focused, with very appealing dof. Thanks, Heather. Normally I’m not a big fan of dogs in clothes, but for some reason Rocky and Ginger pull it off! It makes me smile too. 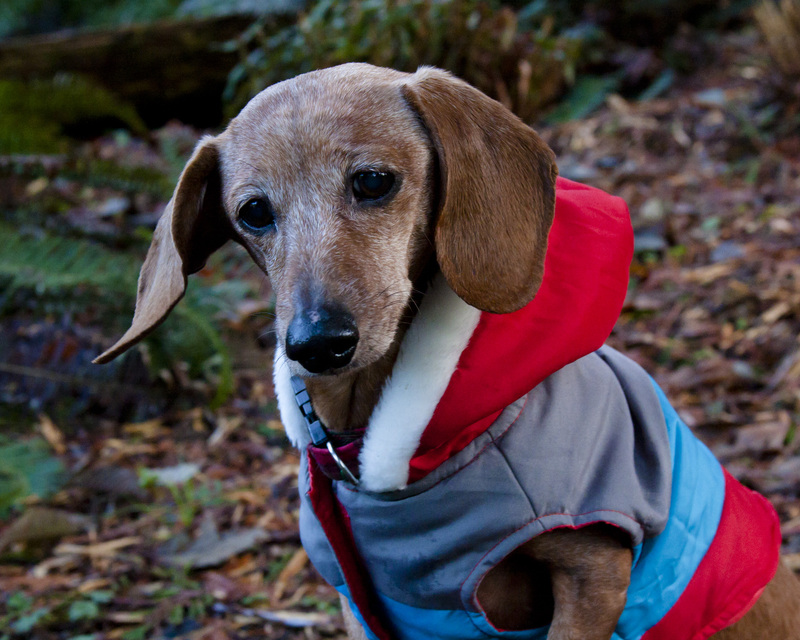 Nice photo – a dog with a hoodie! 🙂 I had noticed there was a lack of animals photos on your site . . . I take a LOT of photos of our animals, and they just won’t sit still. Unless they’re asleep of course. The cat also has this knack of turning her head away just as I’m taking the photo. I think one needs to take a lot of photos to get a couple of decent ones. With dogs treats often help, of course. Have somebody stand off-camera holding something they want. I once heard a National Geographic photographer say that he would compose a photograph i.e. background, lighting etc, and let the animal “walk into it”. I think what he meant is that you need to anticipate how the animal is going to move. Can’t help much on the technical side. I’ve had some very funny shots of Rosie where her eyes glow in the semi dark. Makes her look like an alien. I like the anticipate advice. That makes a lot of sense. I did take a TON of pictures, probably 75% more than what I’ll actually use, just to get the shots I need. It was a lot of fun, though. And with the green, glowing eyes…they do look a little extraterrestrial!